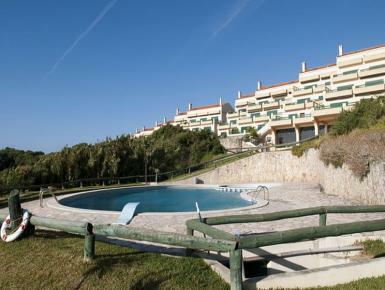 Luxury apartment in condominium, enjoying a breathtaking sea view, 11 Km north from Nazaré, 300 m from the beach (private access), located between the beaches of Paredes de Vitória (900 m) and Vale Furado. Within 900 m from the property one finds a minimarket and restaurants, bank and pharmacy within 5 Km. Tastefully furnished and equipped with central heating, the apartment comprises two floors consisting of 3 double rooms, 2 full bathrooms (one of them with Jacuzzi), 1 living room with dining area, another living room in the upper floor, equipped kitchen, outside barbecue, private terrace e solarium with sea view (48 m²), garage, shared swimming pool, tennis court, squash and children playground.